The day was totally socked in. Realizing that I would not be back to this area any time soon I tried to capture the mood of the place. 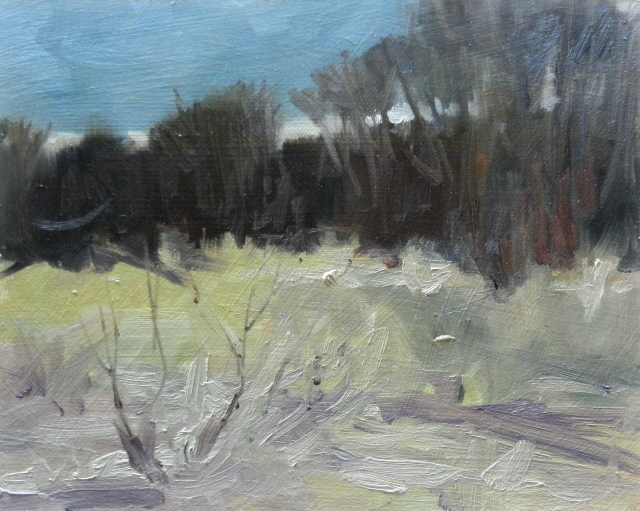 This 6x10 study doesn't look like much but has done the work of imprinting the scene and color in my mind. Now I will work from photos and sketches for a larger studio painting.....starting with value studies to work out the composition. This study was from a photo taken the following day .......much clearer as you can see, but lacks a lot of the drama and mystery of the first day . I think I can combine them for a more defined design with some of the original atmosphere. 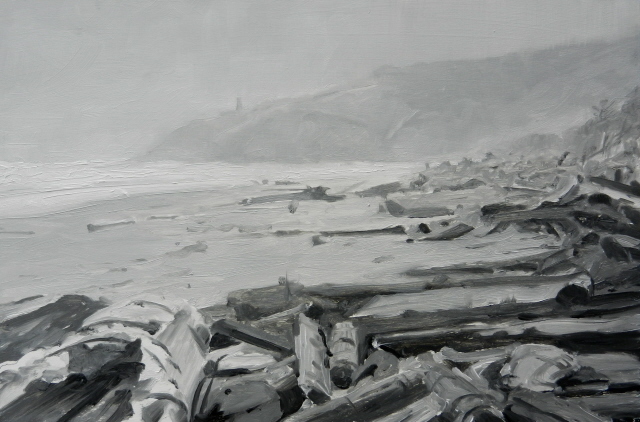 The value study shown here is an even better composition with the lighthouse visible through the mist and the drift wood creating movement into the scene and even a sense of danger and mystery. On another interesting note....We found this debris. 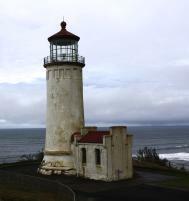 apparently washed across the Pacific ocean from the tsunami in Japan, a few hundred yards up from this spot on the beach at Cape Disappointment. 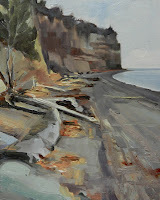 Lots of events are coming up with The Plein Air Washington Painters this season! One that I am excited to be a part of is the State Parks Centennial Show. Washington Sate Parks are celebrating their 100th anniversary this year and PAWA is partnering with them by hosting many paint-outs in the parks. In Oct through Dec. there will be a juried show exhibited at American Art Company in Tacoma of the work generated by the group. The entries will consist of a plein air painting and the resulting studio painting done from that study. 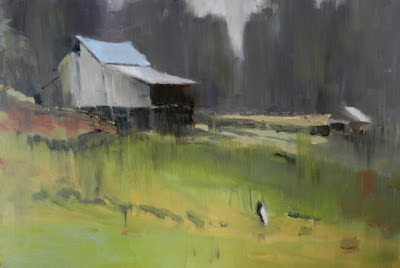 I am considering the plein air study above for a larger studio painting. 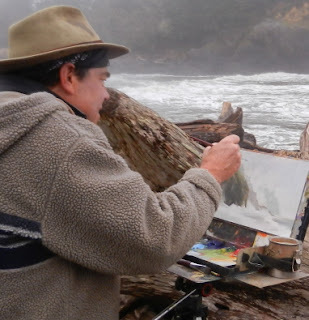 I am really excited about painting the state parks this year and am getting more and more comfortable getting out and painting in all kinds of weather. I have found out that , with oil paint, if it starts to rain you can just dump the water out of your palette and keep going! We took so many good pictures on this trip that I can't possibly post them all....But there will be paintings! One of the must-do activities at Cape Disappointment is the Lewis and Clark Interpretive Center. 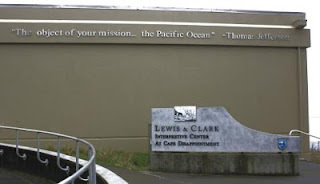 This was especially interesting to me as I had just finished "Undaunted Courage" about the Lewis and Clark expedition. My wife Ann and I always like to mix business with pleasure...=] This painting trip was also our Valentines Day get-away! 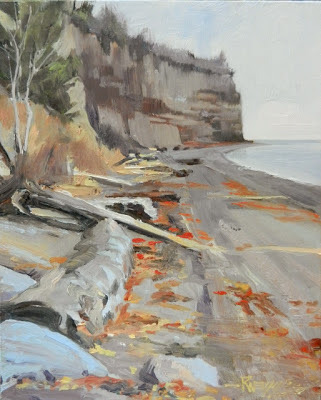 "Clear Creek Park" plein air oil painting by Robin Weiss"
There is a cool little park near Silverdale that used to be a farm with open fields. 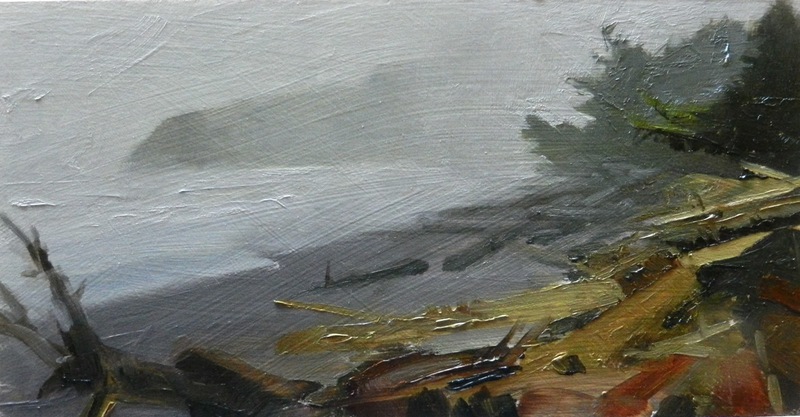 The county has turned it into a park with boardwalk trails...I drove over on another overcast day to try and get a painting...after much groaning, scraping , pounding my fists on the ground and other useless antics, this is what I ended up with. I put the boardwalk into the painting at first as a lead into the scene but it just wasn't working for me ....so I scraped it out..
That very issue was mentioned in the mini article in Plein Air Magazine about a workshop I attended in Montana with my buddy Darrell Anderson, Cathe Gill and Bob Phinney. 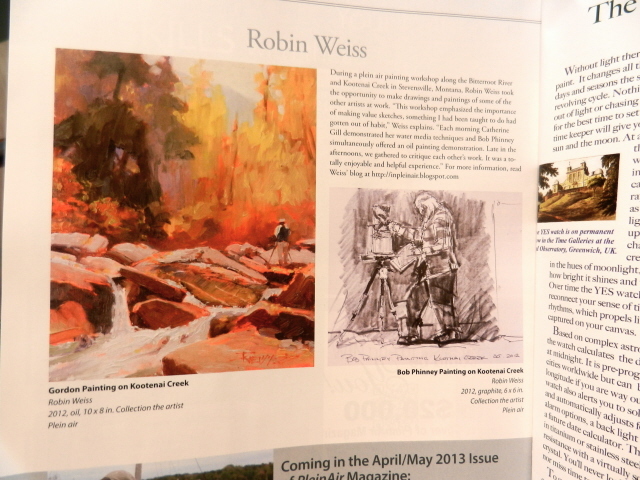 Did I mention that my plein air piece "Gordon Painting on Kootenai Creek" was published in Plein air Magazine!! There it is in full color along with a sketch of Bob Phinney in the March/April edition! More on the value study stuff in my next post. The sheep farmer across the road came over on his John Deer tractor to say hi and see what the heck I was doing..He told me tending sheep is a full time occupation....I believe it! We parted ways both happy with our chosen professions. There was still some daylight left after finishing my painting on Old Gardner Rd. so I headed to Sequim (pronounced Squim, silent E ) hoping to find the sun. They say Sequim is in the "Banana Belt" around here and gets the least amount of rain. The sun never came out but I found a good spot to set up by the boat launch at the end of Port Williams Rd. The distant point provided a good focal point and the beach with the driftwood leads the eye to it. 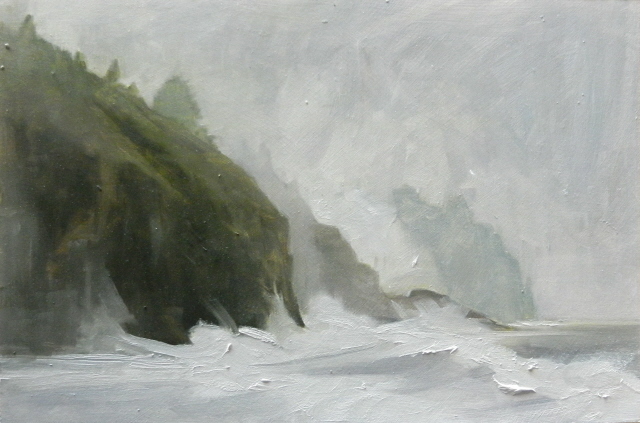 I touched the final painting up in the studio using the photos I took on location.